For travelers who love culture, visiting the UNESCO World Heritage Sites of Vietnam should be on top of your list. The country attracts millions of visitors from around the world, thanks to its stunning landscapes and interesting culture and history. As of 2017, there are 8 places in Vietnam that have been given the title UNESCO World Heritage Sites. If you can only visit a few of them, here are 5 of the UNESCO World Heritage Sites in Vietnam that you must see on your trip. Listed as a UNESCO World Heritage Site in 1999, My Son Sanctuary is regarded as one of the most beautiful temples across Southeast Asia. The temple complex consists of partially ruined Hindu temples that were purposely built in honor of Hindu god Shiva. 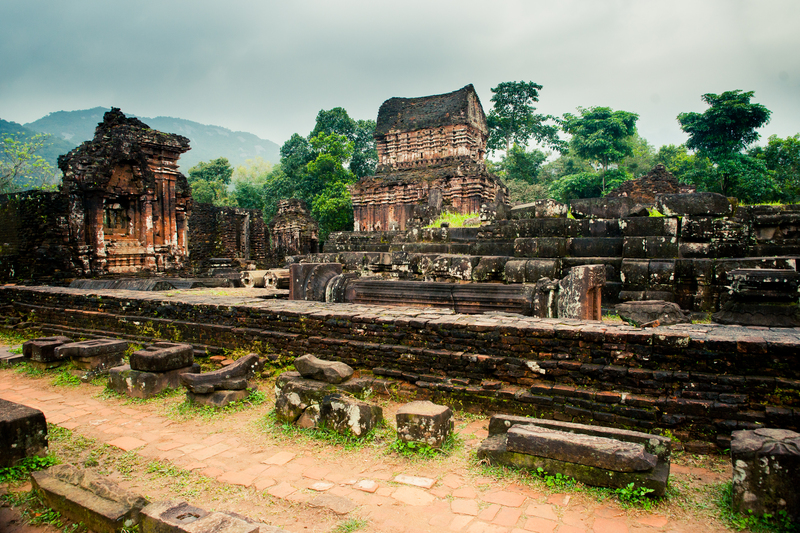 Built around the 4th to 14th Century AD, the temples were built in a valley with scenic mountain ranges. The temples lie in a valley that’s about 2-km long with the scenic beauty of nature in the surroundings. The best way to reach My Son is to take a taxi coming from the city of Da Nang. A cheaper way would be to take a public bus although this can really take a long time. It’s also a good idea to get in touch with a travel company that can arrange a tour for you in My Son and will provide the transportation. Hoi An is another cultural heritage site that is known for its charming colonial buildings built between the 15th and 19th centuries. Walking along the town’s charming cobblestone streets, you’ll be passing by weathered colonial shop houses and ancient old ancestral homes. There are also beautiful temples and pagodas and a river that’s beautifully lighted with bright red lanterns when evening comes. If you’re visiting Hoi An, the best way to get there is to take a taxi from Da Nang. There are also public buses that you can take going to the town coming from the city of Da Nang. Most tourists would stay in Da Nang and will simply take a day trip to Hoi An. Phong Nha is located in the province of Quang Binh and is part of the Annamite Mountain range. Nature lovers are easily attracted to the outstanding limestone formation of this national park. It covers an area of 26,236 hectares of dense forests with underground rivers and enormous caves. Phong Nha holds the title of having the second largest cave in the world, the Hang Son Doong. It’s home to a number of impressive terraced caves, suspended caves, and intersecting caves. Several endemic species have also been spotted in the national park, such as Asiatic black bear and tigers. If you’re thinking of visiting Phong Nha – Ke Bang National Park, the fastest and most convenient way is to take a domestic flight going to Dong Hoi Airport. There are a number of flights coming from Ho Chi Minh and Hanoi. You can also take a train going to Dong Hoi coming from the major cities of Vietnam. Trang An is a scenic landscape complex located in the city of Ninh Binh. The city has long been attracting visitors due to its historical sacred temples, serene countryside, and dramatic landscape views. Located in the southern portion of the Red River Delta, the Trang An complex offers spectacular views of limestone karst peaks, steep cliffs, and majestic valleys. The complex is also home to beautiful temples and pagodas, scenic rice paddy fields, and charming villages. Having listed in the UNESCO World Heritage Site in 2014, this place is the most recent site in Vietnam to have been added on the list. The city of Ninh Binh is located 110 km south of the city of Hanoi. From Hanoi, you can catch a bus going to Ninh Binh to visit the Trang An Landscape Complex. Upon arriving in Ninh Binh, hire a taxi or take another bus that can take you to Trang An. You can also choose to hire a motorbike from Ninh Binh and drive to Trang An. Ha Long Bay is perhaps the most popular in this list. This spectacular bay has been attracting thousands of tourists for many years now because of its jaw-dropping views. It comprises of 1,600 islands and islets within the Gulf of Tonkin, forming a beautiful landscape of various limestone pillars. Most of the islands are uninhabited making them even interesting to explore. Ha Long Bay is only an hour away from Hanoi. There are several travel companies that offer a day trip to Ha Long Bay from Hanoi, although the best way to explore the bay is to book an overnight cruise. During your cruise, you can take part in some water sports activities such as kayaking, snorkeling, or simply relaxing at the sun deck and admiring the beautiful views. Are There Any Vegetarian Restaurants in Vietnam?